This holiday season, I’m switching things up a bit. I’m hosting a cozy gathering with just my immediate family, complete with matching pajamas! There will also be delicious food, of course. 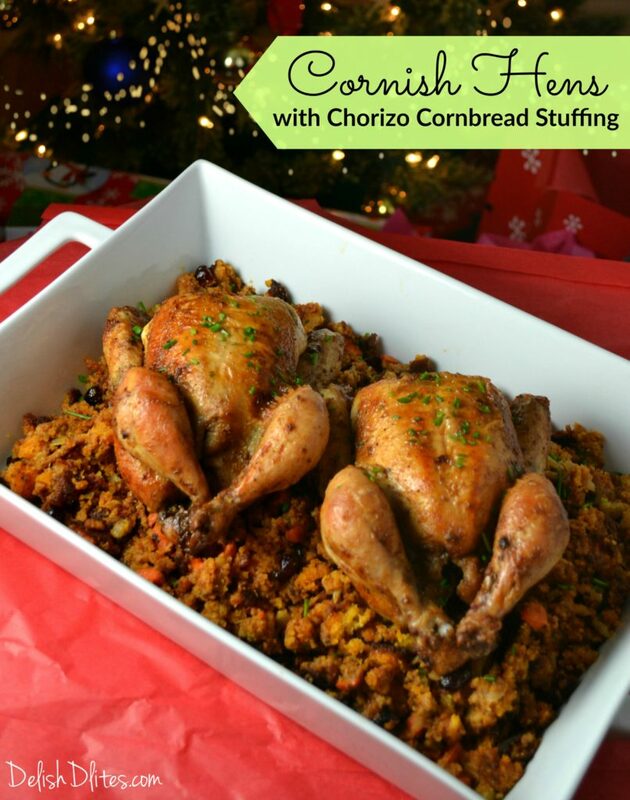 This year, instead of the traditional ham or turkey, I’m serving up Cornish hens with chorizo cornbread stuffing, featuring Tyson® All Natural Premium Cornish Hens. There’s nothing more show-stopping that plating a whole roasted Cornish hen, it makes an ordinary meal feel super special, and even a little luxurious. 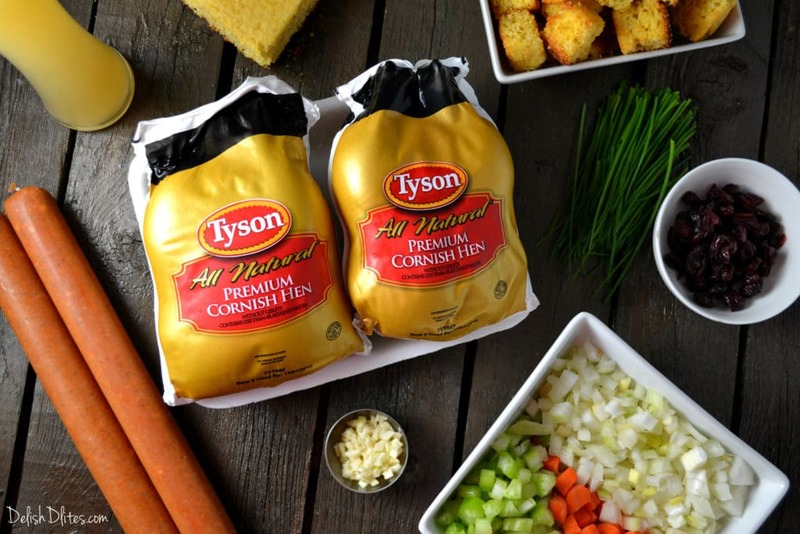 I’m all about eating real, wholesome food, and Tyson® All Natural Premium Cornish Hens are 100% All Natural with no added hormones or steroids. 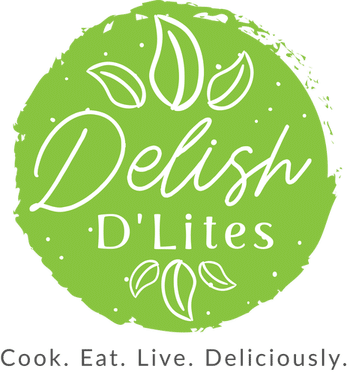 They contain no artificial ingredients and are minimally processed, so I can feel good about what I’m serving to my loved ones. 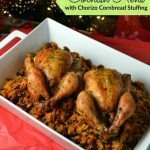 This delicious recipe features whole roasted Cornish hens, seasoned with a smoky, garlicky spice blend, and a scrumptious chorizo cornbread stuffing – it’s a perfect holiday meal to impress your guests, and they’ll never know how easy it was to pull together! 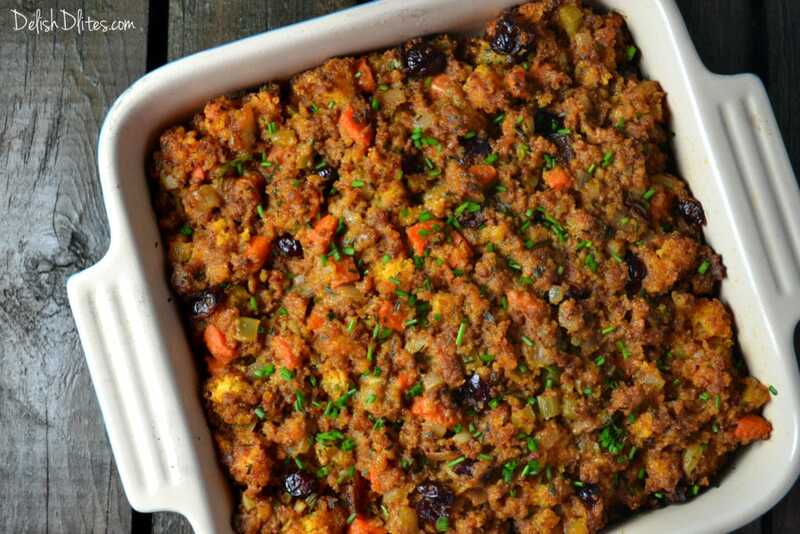 First, let’s make the stuffing (this is a great make-ahead dish). 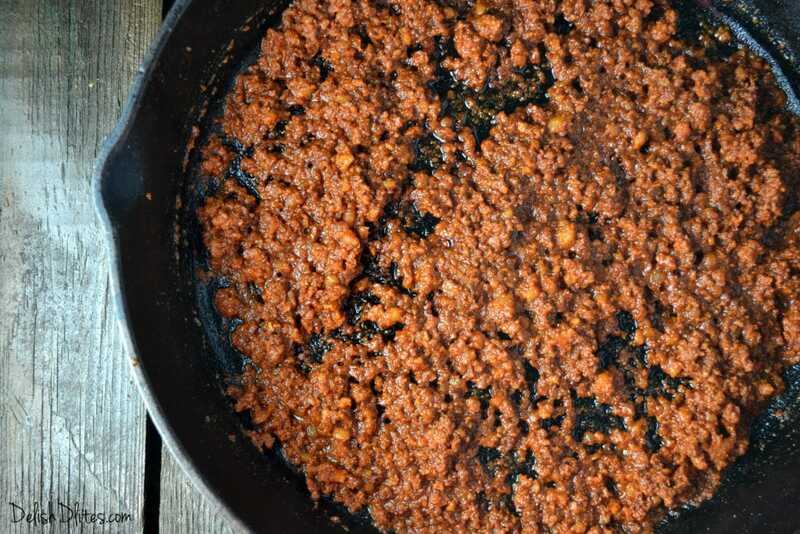 Cook the Mexican chorizo in a dry skillet over medium heat, breaking up with a wooden spoon. Once it’s crisp, pull it out of the pan with a slotted spoon and set aside. Remove 2 tablespoons of the chorizo drippings and set that aside as well. You’ll be using that to season the Cornish hens. In the same pan, add the carrots, onions and celery, and a pinch of salt and pepper. Saute the veggies for 10 minutes, or until tender. Add the garlic and rosemary, and cook for 2 more minutes. Combine the chorizo, veggies, cornbread, cranberries, chicken broth egg, salt, pepper and 2 tablespoons of chives. Transfer the mixture to an oven proof dish. Cover with foil and refrigerate while you season the Cornish hens. For the Cornish hens, combine the chorizo drippings, olive oil, smoked paprika, garlic powder, rosemary, salt and pepper to create a flavorful paste. Spread the mixture all over the Cornish hens, both inside and out. Place the Cornish hens on a baking sheet lined with a rack. 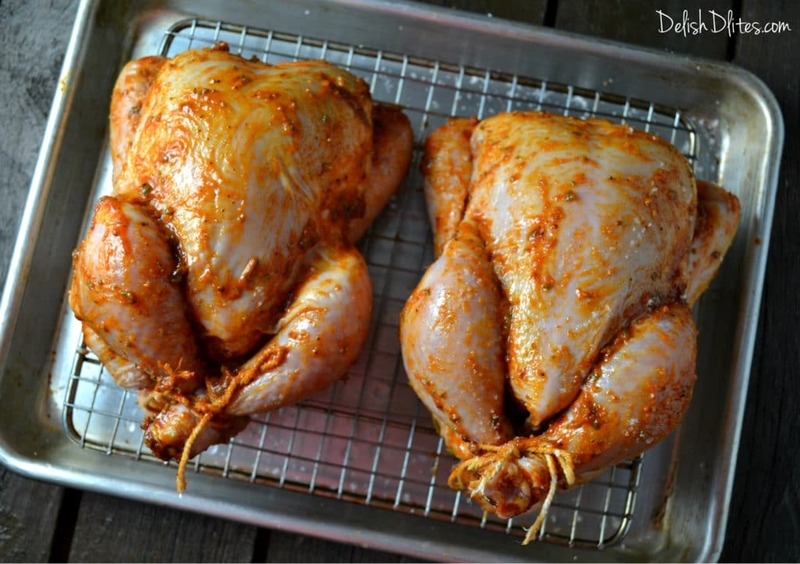 Tie the legs together with butchers twine so the Cornish hens cook evenly and keep their shape. Also, tuck the wings back so the tips don’t burn while they roast. Roast the Cornish hens at 400°F for 20 minutes, then lower to 375°F and roast until the internal temperature reads 165°F on a meat thermometer (this should take another 30-40 minutes, depending on the size of the hens). To get the skin nice and crisp, baste the hens every 20 minutes with chicken stock or olive oil. 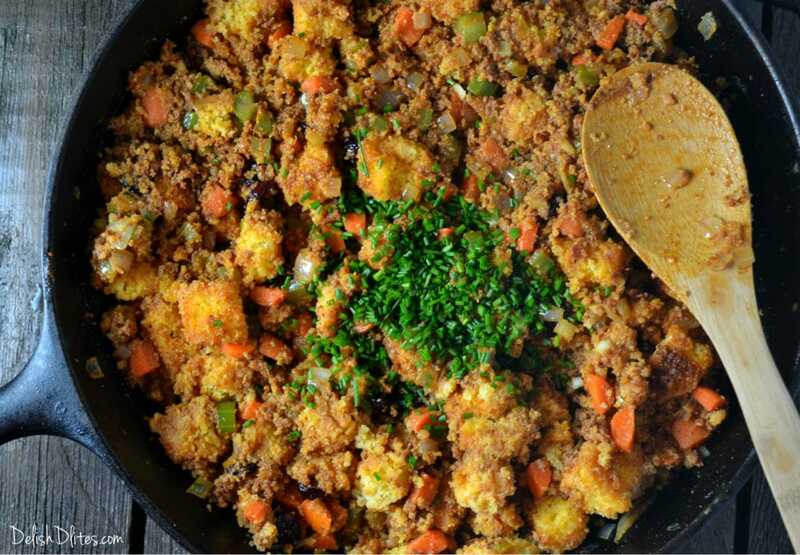 Pop your chorizo cornbread stuffing into the oven with the Cornish hens during the last 20-25 minutes of cooking, just to crisp up the edges. 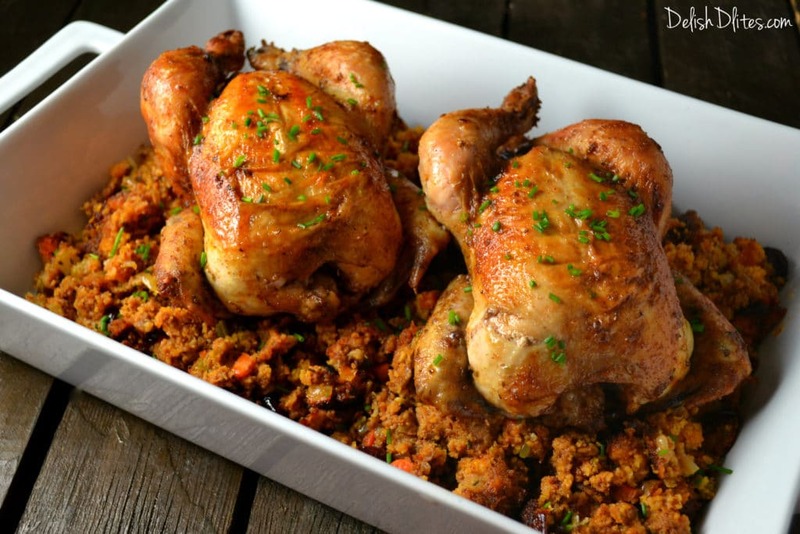 Serve the roasted Cornish hens on a bed of the chorizo cornbread stuffing, and garnish with the remaining fresh chives. A good serving size is half of a Cornish hen per person. You can serve these alongside some roasted veggies or a salad for the perfect holiday meal. Cook the Mexican chorizo in a dry skillet over medium heat, breaking up with a wooden spoon. Once the chorizo is crisp, pull it out of the pan with a slotted spoon and set aside. Remove 2 tablespoons of the chorizo drippings and set that aside as well. You'll be using that to season the Cornish hens. 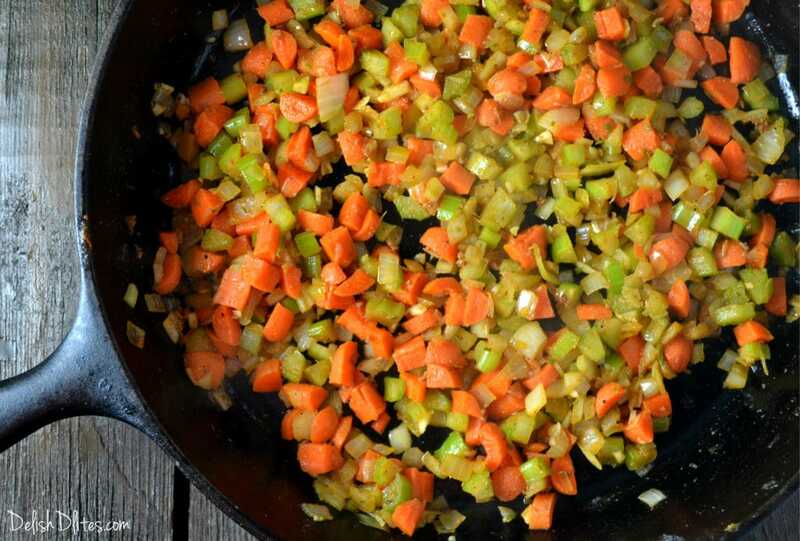 In the same pan, add the carrots, onions and celery, and a pinch of salt and pepper. Saute the veggies for 10 minutes, or until tender. Add the garlic and rosemary, and cook for 2 more minutes. Combine the chorizo, veggies, cornbread, cranberries, chicken broth egg, salt, pepper and 2 tablespoons of chives. 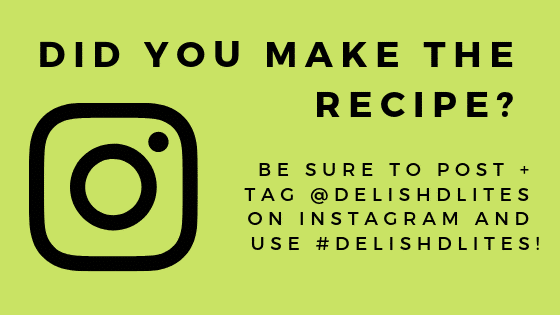 Transfer the mixture to an oven proof dish. Cover with foil and refrigerate while you season the Cornish hens. Combine the chorizo drippings, olive oil, smoked paprika, garlic powder, rosemary, salt and pepper to create a flavorful paste. Spread the mixture all over the Cornish hens, both inside and out. Place the Cornish hens on a baking sheet lined with a rack. Tie the legs together with butchers twine so the Cornish hens cook evenly and keep their shape. Also, tuck the wings back so the tips don't burn while they roast. Roast the Cornish hens at 400°F for 20 minutes, then lower to 375°F and roast until the internal temperature reads 165°F on a meat thermometer (this should take another 30-40 minutes, depending on the size of the hens). To get the skin nice and crisp, baste the hens every 20 minutes with chicken stock or olive oil. Serve the roasted Cornish hens on a bed of the chorizo cornbread stuffing, and garnish with the remaining fresh chives. I made this on Mother’s Day. It was fantastic. Loved the flavors.